Sorry, fellow white dudes. We’ve had a good run, but by 2044 we will be the minority in the US. If that’s the case, however, why aren’t we already seeing more women and minorities in positions of power in most companies — especially tech-related companies? Questions like this have gotten me thinking. That’s one of the reasons I was so glad to have Angie Jones on the latest episode of Test Talks to discuss the subject of women and minorities in tech. In Angie’s experience, lots of companies say they’re looking to recruit more diversity into their workforce, but frustratingly, we’re not seeing those numbers increasing at the top companies in Silicon Valley, for instance. Facebook received quite a bit of flak recently because a report showed that for the third year in a row the number of minority employees has remained static despite their expressed commitment to increasing diversity in their workforce. Several years ago, a CNN report also showed that Google had relatively few female engineers and executives. Based on that report, women accounted for only 30% of all Google’s employees. So the question is, how can these and other firms improve their outreach efforts? As a woman of color herself, Angie’s advice on how to go about solving this issue is to go where the talent is. For example, she doesn’t see many companies engaging with historically black universities, or colleges that serve Hispanics or other minorities — which is a shame, because that’s where the untapped talent is going to be. Those institutions are where minority students are being trained to become computer scientists and engineers, so that would be a great start – simply recruiting from where the talent is. The earlier girls can become interested in the field by being exposed to technology and programming, the better off those fields will be. There are a lot of organizations that are focused on training women and minorities and recruiting them into the technology field. For example, there are groups companies can collaborate with to help address this issues, including Tech Girls — an organization Angie assists — which focuses on getting middle school-age girls interested in technology. Tech Girls is an answer to the drop that occurred in the 80s, and he way in which computers and technology was regularly portrayed as being for boys only. Tech Girls is committed to letting girls know all of the cool and innovative things they can do with technology. Studies have shown that middle school age is critical, because it appears that that’s about the age where we’re losing them. Another group, Black Girls Code (Angie is a lead for the Raleigh Durham chapter), is teaching girls ages seven to seventeen how to code. They offer their members some fascinating workshops on building mobile apps, creating games, the science of robotics and more. Programs like these are helping to put new talent into the pipeline, so companies will soon have many less excuses for employing less women and minorities; the skills they need will be available among those groups if they truly want them. These things are easy to say, but the proof is actually in the doing. Seeing is believing, and that is something that Angie says influences many women and minorities view of companies commitment to diversity. Angie says that as a black woman interviewing for a job, she always looks at the panel of people the company has put in place to interview her. What she sees actually has a profound impact on whether she plans to accept that job or not. If the panel consists of white men who all look and think the same, it’s much less likely that she’s going to want to work there. That means that she wouldn’t accept a job offer from that firm even if one was extended to her. She always wants to be sure there are women and people of color working there; women who are valued enough that they are being asked to interview potential employees. Angie explains that the one thing she has loved most about the places she has been fortunate enough to work at; right off the bat, the diversity was there, and it made quite an impression on her as a potential employee. These companies show diversity rather then just saying they promote diversity with nothing to show for it. So much so that they value their diverse employees enough that they make them apart of the interviewing process. The last (and probably most important) piece of advice Angie offered for hiring and retaining more women and minorities is to simply acknowledge them. Acknowledge their presence. Acknowledge their contributions. Value them. Let them know that you want them to be there; that you need them to be there. It’s not just a diversity checkmark you’re trying to acquire; you actually value what they bring to the table as a person, as a technologist. Women and minorities just want to be treated like everyone else rather than be ignored or made to feel as though you’re lowering the bar to bring them in. Simply put, treat them as you would any other technologist. Joe: Hey Angie. Welcome to Test Talks. Joe: It’s awesome to have you on the show. Before we get into it though, can you just tell us a little bit more about yourself? Angie: Sure. I’m an automation engineer currently working at Lexus Nexus in Raleigh North Carolina. I’ve been doing automation for a little over ten years now. Also adjunct instructor teaching Java programming which I’m certified in and a master inventor. Joe: Awesome. I notice you have around, I don’t know if I counted right, 21 patents. How did you get into actually inventing? Angie: When I was working at IBM, I saw a black lady down the hall and she had an award on her wall for a patent she had come up with. I just thought it was the coolest thing every. Wow. This lady who looks like me has a patent on her wall. I got with her and told her I was interested in learning more about it. She mentored me and basically brought me into one of her brainstorming sessions with another black lady. They showed me the ropes on how to go about coming up with ideas and recognizing problems that don’t currently have a solution and generating your own solution to it, then walking me through the patent process and how to go about applying for one. Joe: Awesome so it sounds like you had some mentorship and they showed you the ropes. Joe: I guess I’m going to jump right into it. You are a woman, you’re a minority. You’re in a field that heavily male-dominated I would say. Joe: It’s like you’re really a rarity. I think that’s cool and that’s great but how do we make it not so rare? How do we? It sounds like you had role models when you started your position. That started you off on the right foot. Any thoughts around that how we can encourage more minorities and women to get started in the work place and, when they do, to encourage them and to encourage diversity within our groups? Angie: Yeah. A lot of companies are currently saying that they are looking to more diverse and recruit more diversity in their workforce but it’s really frustrating because you don’t see those numbers increasing at like the top companies actually in Silicon Valley. There was recently a lot of flack given to Facebook because their report came out, third year in a row, after they have committed to increasing diversity and yet the numbers are staying the same. My advice as a woman of color on how to go about solving that is to go where the talent is. I don’t see the companies engaging much with historically black universities or universities that serve Hispanics or other minorities. I don’t see their presence there. This is where your talent is going to be. This is where the students are being trained to become computer scientists and engineers so that’s a start right there, just recruiting and going where the talent is. Joe: Awesome. I think that’s a great point. I was listing to another podcast on NPR I think and they showed a graph of computer majors for women and somewhere around 84 it peaked and then it completely dipped and they couldn’t explain why. They’re trying to find out why. What they think what happened is, in the 80s, it really started to become more of a boys type club. Joe: They would feature the computer in places where guys would go like Radio Shack. You have a certain clientele that goes to Radio Shack. It’s almost like rather than put it other places, it seemed to be really geared towards a certain clientele and overtime, that kind of formed the opinion of well this must be something for geeky guys to get into and no one else. It almost sounds like your advice is the same. You need to go to where the talent is and not necessarily hand pick some places where you assume that your particular product or your particular client would be. Angie: That’s very interesting you brought up the NPR study. I did a fascinating talk on that earlier this year and actually went and found some of the commercials from the 80s and made a very compelling argument on how marketing plays a very influential role on painting the picture of what a computer programmer or someone who likes computers, what that person looks like. That was very interesting. 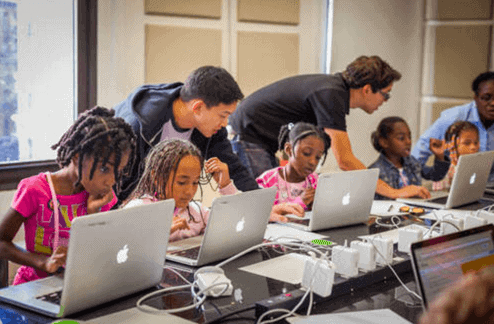 There’s a lot of organizations that are focused on training girls and women and people who are minorities and training them to get into technology. These are other resources that these companies can work with. For example, I work with Tech Girls which is an organization which caters to middle school girls in trying to get them interested in technology and is a direct answer to what happened and what occurred in the 80s when there was a drop and how it kind of painted a picture of it being a boys club. This is our response to that and letting girls know that there are cool and innovative things that they can do with technology as well. We find that’s where we’re losing them, about the middle school age. Then there’s another group, Black Girls Code, and I actually lead the Raleigh Durham chapter of that, where we’re teaching girls seven to seventeen how to code. We do fascinating workshops with both of these groups like building mobile apps and robotics and creating games and all sorts of really cool things in technology. We’re definitely putting people in the pipeline to be ready for these companies. They’re there if they really want them. Joe: Awesome. You brought up another great point. You also mentioned that study I believe or a similar study that early education or early exposure to computers the better off. A lot of these guys were exposed to computers earlier on. When they got to college that they already knew some basics where some of the women, for some reason, didn’t have that advantage. It sounds like that’s something you’re attacking also getting girls interested sooner rather than later. Angie: Right because once we attract them, the next problem is how do we retain them? How do we keep them here? Like you mentioned, they get to college and, I’m an adjunct instructor, I’ve seen this first hand. For me, fortunately, I went to a historically black college so I didn’t face those same challenges. Everybody around me was kind of in the same boat. I didn’t have any exposure to computer programming or anything before I went to college. Joe: How do you break that mindset? How do you get people, once they’re in the class, once you’re teaching, to really open up to the whole class so they don’t get discouraged? Angie: I do a lot of call and response and I try to include everyone. I’ll ask questions and it’s a very interactive class. I’ll ask questions and things. Typically I just taught it so everyone should know it. By them responding, that kind of gives them the confidence that “Okay. I do know this” and “Yep, I got it right.” They’re more engaged then and they feel more confident about the course and can apply themselves more and feel less intimidated. Joe: You also mentioned Facebook with their minority program, women program, the ratio is off there. I also saw another study with Google where I think only 30 percent of all Google employees were women. I guess they always say that they’re focusing on diversity, they’re focusing on expanding the pool of talent. What do you think is the reason for that? Is it just perception where they don’t? Is it racism, subtle racism or they’re not going to the right places like you said originally? I know it’s a complex, controversial kind of question. I’m just curious to get your take on that. Angie: There are a couple of reasons in my perspective. The first one being they may say this, “Oh yeah. We’re all about diversity and inclusion.” They always have the caveat, “But we don’t want to lower the bar.” They kind of drill that into their hiring managers heads to the point where they start believing that, “Oh. If I give a minority or a women a role then am I lowering the bar?” They start second guessing themselves and treating that person as if they aren’t as qualified when they are. I’ve been at the table where I’m interviewing people for jobs or been on a panel where I’m interviewing people. I’ve seen it first hand where a person of color or a woman will come in and they pretty much treat them the same in the interview. The questions aren’t tougher or different than what they would ask of a male. However, when we got compare notes at he end, it’s like “What did you think of the person?” You can see their perception of the person is different. I’ve actually called people out on this. I haven’t said blatantly like, “Oh, is it because she’s a woman” or “Oh is it because they’re a person of color?” I’ll say something like, “Hmm. That’s interesting. We just offered a position to such-and-such guy.” It might be a white male. “We just offered a position to that guy. Let’s compare this one to that one. It seems that this person has just as much experience if not more. It seems that this person did just as well if not better on the technical interview so what are your concerns exactly with this person?” When you start calling those things out, they kind of rethink and they don’t have an answer for that, then they realize “Oh well maybe we should give them shot.” There must be something there that made them feel like they were lowering the bar or this person wasn’t as qualified. The second reason is that they feel that this person won’t fit in the culture that they currently have. That very well may be true because the culture is one that dominated by white males. How do we fix that if we don’t allow for the culture to change or we don’t allow for people who bring in diversity to come and influence the culture. Me, as a black woman, when I go and interview at a company, I’m looking at the panel of people that the company has put in place to interview me. That has a very profound impact on whether I’m going to accept that job or not. If it’s a panel of a bunch of white guys who all look the same and think the same, then, more than likely, I’m not going to want to work there. I’m not going to accept an offer if one is extended to me. I’m making sure that there are women who work here, women that are valued enough that you are sending them to interview potential employees. That there are people of color here. That’s what I really loved about the places that I have been fortunate enough to work at is, right off the gate, that was there. That made such an impression on me as a potential employee. Saying, hey, we do have … Without saying it, you know? It wasn’t something that was verbal but I could see it with my eyes. Hey, we have diversity here. Hey, we value our diverse employees enough that they are apart of the interviewing process. Joe: How do we talk about diversity without being uncomfortable? I feel like I would be … I work from home and I’m thankful for working from home because I don’t know how to interact in a modern workplace. I’d be so scared to even say anything or even afraid to offend anyone. How can we bring it to the attention? There’s something going on here. There’s something not right. Look at the news that’s happening in the past few weeks. Something is clearly wrong but how do we talk about it without having these weird polarized opposite views and bringing people together to say, I understand your perception. Here’s mine. How can we get over that? Angie: That’s a good question because I feel like, as women and as minorities, we are all about talking about it. We almost have a pass to do so. Yeah, sometimes I want to engage in these conversations with the white males that I work with but it’s clear, if I bring it up, that they’re uncomfortable so I kind of just let it go. I think if you come from a place of honesty, it’s okay to talk about this. This is the reality. This is life. It’s okay to talk about our differences and our world views and our perceptions. That’s fine. Joe: A lot of people also bring up the argument, why does diversity matter? Shouldn’t it be merit based? Why do we care if someone is a woman or not a woman or a guy. A bug is a bug, is a bug. It doesn’t matter who finds the bug. Why does diversity matter? Angie: I think that is absolutely the key in getting the change that we need within the companies. Until they see why it really matters, they’re not going to put forth the push that they should to get diversity included. In my opinion why it matters is because everyone brings different perspectives, cultures, view points. If you’re selling a product, you’re not just selling that product to white males. The people who are developing this should represent your customer base because they’ll bring perspectives from the customers that you’re looking to reach. They also bring just different and unique views to the development process. I really strongly believe that, myself as a black woman, the reason I’ve been so successful and innovative in technology is because my perspective is so different from the people that I work with. When given a problem, my background, everything I’ve done in life plays a part in my thinking process. My background and my life is much different than that of a white male so I’m going to bring a unique perspective. I’m going to bring a unique solution to the problem. I’m going to bring something that’s appealing to other women and to other minorities. That’s why it’s so valuable. Until companies realize that and see the value, that’s what I try to bring as a black woman in technology, making sure that I’m contributing value so that they see this and know, hey, we need more like her. Joe: Awesome. I going to bring up my answer and it’s probably cynical or terrible to say but I think diversity is about money. I think if you tell a CEO that they go, huh, wait a minute, you might have a point here. Joe: The reason why I say that is I saw in 2040 or something, white males, eventually we’re going to become the minority. Joe: The first thing is that’s number one. Number two is I believe I saw another study that like 85 percent of all consumer purchases were done by women. If you run a company, it’s almost like it’s about money because if you don’t have women in your organization, especially in leadership positions, that really understand your consumer like you said, then you’re going to lose money. Not only does it give a unique perspective to maybe a spin on your products but you actually, I think, in order to get insight into your target audience you’re going to need women, minorities as part of team. The earlier you start, the better off you’ll be in the long run because the trends are there that eventually it’s going to be the new norm. Angie: Yep. That’s exactly correct. You already see companies make very stupid mistakes and it’s clear, by like the marketing campaigns that they put out, it’s clear they don’t have the diversity that they need on the team. Had they, this would have never seen the light of day. One that I can think of just yesterday I saw a tweet. What company was it? Amazon I believe. They put out a conference for women, “Smart is Beautiful.” Well, as a woman, I’m offended. Several other women were offended as well because this was a technology conference and just that phrase is offensive to women. Like, oh, we just have to be beautiful and that’s what we care most about and who cares about being smart for smart sake or for making a difference in the world. You want to be smart because you want to be beautiful. The whole concept of as if we aren’t already smart. This is a technology conference. We’re smart already. That was offensive and it was clear that either you don’t have women on this team or the women who are there are not speaking up. That’s what I want to say to my fellow women and minorities. When you do have a seat at the table, be sure to speak up. Don’t sit by quietly and let these kind of things fly. Speak up. Joe: I grew up, I have three older sisters. I’ve never seen them have an issue speaking up. What you said makes a lot of sense. To myself it’s all about perception. To me, I would have thought, yeah, smart is beautiful, yeah, big deal. I wouldn’t have even thought of that. That’s cool. I would think I was being all open and all diverse and all of a sudden I’m getting like nasty tweets saying Joe’s a perv or something. It’s interesting how we have these different perceptions. Joe: You said having different people on your team to round you out, maybe can say hey look you know to you it may not seem like a bad thing but to us it’s not right. As you mentioned you are a certified Java developer. You teach Java. You’re also into test automation and one of the hurdles I’ve seen people ask me about is that, they’re trying to get into test automation, they have to learn Java, but they don’t know how to start. Do you have any tips on how someone that doesn’t have a programming background could learn Java better to help them with their testing efforts? Angie: Yeah. I see that a lot as well but then I also see the hesitation to put forth the effort to learn it. There are tons of free workshops and tutorials online that they can get involved with. There’s nothing wrong with enrolling into a class. You know there’s organizations that offer classes. There are the technical colleges that offer these continuing education classes. I really would recommend just going to take a class. Take a semester of Intro to Java Programming. I’m not sure what the hesitation is with that. What do you think Joe? Joe: I think Java’s such a heavy programming language. You have to all this boiler plate code to get something running. I just wish if people start like with Python, right. Three lines of code, bam, there it is. They’re starting off sometimes, they have no programming background, they’re just jumping into it with Java. I also think Alan Richardson has a really good book. A lot of books that I’ve read trying to learn Java in my career early on are geared towards developers. When you’re doing test automation, you just need a smaller subset. You don’t need like 90 percent of what the book goes over yet. Joe: I think people sometimes, like you said, they get overwhelmed or they’re afraid to dive in because they’re looking at all this other stuff where, really, only 10 percent of it is what they need to know right now. Just do that and then learn the other stuff as you go along. Angie: Ah. That’s a good point. Joe: Awesome. I should have asked you this at the beginning. How did you get into test automation. Angie: It’s really funny. I actually was hired. I got certified in Java in college so before I even graduated from college I was certified. I was recruited from college to work as a Java developer. By the time I got there, there had been a reorg so I had a new manager now and the new manager, for whatever reason, put me in a testing role as opposed to the development role that I was hired for. It was a test automation role. That’s how I got involved in it. I did well with it but, in the back of my mind, I still just felt so slighted as if tests were not as good as development so I pushed for a couple of years to go into development and finally was able to go into development. I absolutely hated it. I found that I just was not as satisfied as I was in the test automation role because, in that role, I was just able to see so much more of the application and contribute to all these different features whereas, in a development role, it was very kind of [inaudible 00:24:31] down, not as collaborative. They had a very small view of the application because I just need to work on my part and that’s it. I just hated it. I got back into test automation as soon as I could and realized that it definitely was not a step down and test is not inferior to development. We contribute just as much to the overall product as the development team. I’ve been there ever since and I love it. Joe: Awesome. It really is a different mindset and funny how people pick that up. I enjoy the testing aspect of it better than pure development myself also so that’s cool. Hey, how did you get into Ebony? That’s like getting into Rolling Stone isn’t it? It’s like an iconic magazine. Angie: You know what Joe, I have no idea but Ebony contacted me and just said, “Hey we want to include you in the 30 under 30 list. Can you send us a high quality picture?” I didn’t even send any information about myself. I have no idea to this day how they found out about me. I’m glad that they did. That’s been one of the highlights of my career. Joe: Look, Angie, before we go, is there one piece of actual advice that you can give someone to try to help increase awareness for women and minorities in tech or getting more women and minorities in tech involved in technology and development? Let us know the best way to find or contact you. Angie: Sure. I guess my one piece of advice, it’s probably the most important piece, is to just acknowledge them. Acknowledge their presence. Acknowledge their contributions. Value them. Let them know that you want them to be there, you need them to be there. It’s not just a diversity check mark that you’re trying to get but you value what they bring to the table as a person, as a technologist. We really just want to be treated like everyone else and not ignored or be thought of as you’re lowering the bar to bring us in. Just treat us like a technologist. You can find me on Twitter. I am techgirl1908 also, on LinkedIn, Angie Jones. Thanks for discussing the gender and race disparities in the tech industry. Tech startups and small businesses are being funded and started at higher rates than ever. It’s a great industry to enter, but first we need to get more people excited and interested in tech.